Do you have at least one year of experience working as a tire tech? Luttrell Staffing Group Alcoa is currently hiring for Tire Technician | General Labor. If you are looking for a job opportunity with a great chance for growth and advancement, this is the job for you. Apply Today! Changing, rotating and balancing tires. Qualified candidates must have at least one year of experience as a tire technician. Please apply by clicking the link below, then call our office (865) 233-7502. Brad is a recent graduate of Bryan College and is currently pursuing his M.B.A. there. 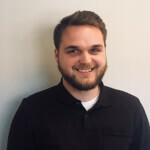 He joined the Knoxville team in June of 2017, and is excited to build client satisfaction and help people find jobs. Brad enjoys playing and watching sports and is a big fan of the Tennessee Vols.